No one vocalist should be able to do as many things as Dawn Upshaw does, as well as she does, and with such remarkable consistency. Yet, as the soprano proved with her Saturday evening recital at NEC’s Jordan Hall, she continues to demonstrate mastery over an unusually wide range of musical genres and styles, fueled by relentless curiosity, boundless enthusiasm and unmatched attention to detail. Upshaw’s latest engagement with Celebrity Series of Boston stimulated intellectually while satisfying emotionally. Equally at home in art music and musical theater, Upshaw champions new music as well as little-known older repertoire ordinarily seen only in the footnotes of Western music history. Saturday’s collaboration with her longtime musical partner, pianist Gilbert Kalish, featured well-loved works by Schubert and Ravel, seldom-heard songs in Hungarian by Bartók and Kodály, as well as contemporary cabaret pieces by William Bolcom. 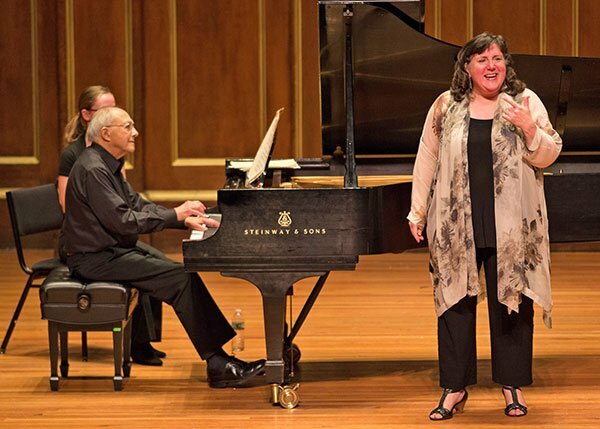 The evening also offered the Boston premiere of On Loving, a new triptych of songs by Sheila Silver composed in memory of Kalish’s late wife, Diane. (Full program and BMInt’s interview with Upshaw can be found here.) Very few vocalists manage to pull off such eclecticism without inviting an ironic wink from their audience, yet Upshaw’s reputation for 360-degree excellence forbids any such skepticism; a consummate performing artist in the fullest sense of the term, she brings emotional honesty, textual specificity, incisive intelligence and unfailing musicality to everything she sings. Beginning with Schubert’s “Im Frühling”, D.882, Upshaw immediately demonstrated her exceptional attention to text—it was hard to imagine that, even without knowledge of German (or the presence of translations in the printed program) any listener could miss her beautifully articulated references to the “schönen Himmel” or see the very “Vöglein” she so clearly envisioned sitting on a branch in the distance. Upshaw’s symbiosis with Kalish was also immediately evident; theirs is as perfect a union of musical minds as could be imagined, natural artistic compatibility and years of collaboration demonstrated by the team’s compleat synchrony. Both artists of immense technical skill capable of the subtlest expressive nuance, they seemed to move and almost to breathe as one. For as good as she was in the first two lieder, it was with the third selection, the ever-popular “Gretchen am Spinnrade” that Upshaw kicked into highest gear both musically and dramatically. The hall rang with bright force of her climactic high note on the word “Kuss”, while her piani and pianissimmi were riveting in their intensity. The set as a whole became an exemplar of the immense power and expressive range that may be achieved in art song, delivering in miniature all the of the most effusive qualities of Romantic opera. One of the secrets to this artist’s success is that she projects genuine enjoyment of every item; the Ravel cycle in particular seemed a source of fascinated delight for the singer, and she couldn’t resist sharing her enthusiasm. After explaining the allegorical nature of the songs at hand, Upshaw gestured toward the piano as if to cue the next piece, then turned back to the audience, admitting “well I wasn’t going to do this, but now I am…” going on to gleefully elucidate some of her own and Kalish’s favorite details about the work, from an idiosyncratic tempo marking on “Le martin-pêcheur” to the alternating ascending and descending thirds that characterize Ravel’s depiction of a crickets legs moving back and forth in “Le grillon.” Beyond her self-evident joy in the art, Upshaw is also fully committed to creating a world of vivid images; we cannot help but “see” what she sees, entering the world she’s created because she so clearly inhabits it herself. It’s this kind of detailed work that allows her (and Kalish with her) to land musical jokes, even when sung in another language. The Ravel cycle was filled with moments such as this—a particularly effective instance had Upshaw reacting exasperatedly to Kalish’s depiction of a troublesome guinea fowl on the piano. Her thoroughly annoyed delivery of the words “elle retourne”, got a laugh from most attendees, not all of whom, one imagines, could possibly be proficient in French. In any language, Upshaw’s enunciation is extremely clear, though not without accent; there is never any doubt that her native language is English. That said, her precise attention to foreign-language pronunciation, to say nothing of her extraordinarily clear, specific use of text renders the presence of the odd American vowel largely irrelevant. Moreover, though she takes on many different types of repertoire, one gets the sense that Upshaw will not venture into territory where she cannot feel 100 percent comfortable vocally. This is a musician who not only possesses exceptional technical control over her instrumetn, but also a magnificent grasp of the types of texts and textures that best suit her emotionally-connected, well-rounded yet eternally youthful lyric soprano sound. The bright, warm clarity of Upshaw’s timbre was particularly well-suited to Silver’s three songs, set to texts by Shakespeare, Edna St. Vincent Millay, and Khalil Gibran. The music for each was effusive but not overindulgent. To set Shakespeare’s verse without getting in the way of its natural musicality is a difficult proposition for any composer, yet the first piece “O, she doth teach the torches to burn bright,” taken from a passage in Romeo and Juliet, somehow managed to expand on the verse without obscuring it. Using an immense vocabulary of dynamic shifts, Silver’s music, as sung by Upshaw, brought about an intense evocation of how it feels to be awestruck by the overwhelming, inherently beautiful sight of one’s beloved. The second song, a setting of a sonnet by St. Vincent Millay, struck an elegant balance between textual expression and illumination, while the third, on a text by Gibran, was pure spiritual rhapsody—Upshaw’s tone embodied pure light, enveloping and enthralling with its tender vibrancy. A faint but ever-present poignancy to her voice produces a quality akin to the cooing of a mourning dove; this sound could not have been more effectively employed in these lush pieces, so exquisitely crafted as an epitaph to a loved one. Before ending with the somewhat outrageous set of Bolcom’s cabaret songs, Kalish treated us to sophisticated interpretations of two solo piano pieces by Janáček, comprising movements I and IV of his piano cycle In the Mists. Finishing the duo’s detour into Eastern Europe, Upshaw and Kalish gave spirited accounts of the seldom-heard Hungarian songs by Bartók and Kodály. Upshaw managed to infuse these with earthy, folk-inspired vigor while never losing sight of the works’ inherently polished art music treatment. Once again her great command of her text—her delivery throughout the concert never failed to make clear that there is no underestimating the theatrical efficacy of a thoroughly internalized word-for-word-translation. By way of an encore, Upshaw performed Stephen Foster’s “Beautiful Child of Song”, dedicating the piece to several unnamed young singers of her acquaintance who were present. If Saturday’s recital occasioned any disappointment whatever, it was only that the hall was not filled to bursting with young singers, who might have learned much in witnessing their esteemed colleague’s masterful recital. For myself, I can only say that I have rarely been so edified and inspired by an evening of song.